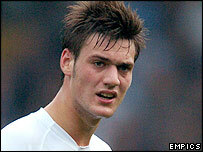 Tottenham midfielder Johnnie Jackson is ready to quit the club in search of first-team football. Jackson has returned to Spurs after a three-month loan stint at Watford and knows he will be on the periphery of the White Hart Lane side. He said: "I've had a taste of playing week-in week-out, and I've been in the position too many times before when I don't get to play on a Saturday. "I'm looking to get away in the summer. I'm 22 and want to establish myself." He added: "It will be hard, having been able to play for the last three months, to have it suddenly taken away again." Jackson could return on a permanent basis to Championship side Watford in the summer after a heartening spell at Vicarage Road. "The whole experience has been great. I've been in my favoured position and I feel I've improved," he said. "I'll have a few options come the summer but I'd definitely consider coming back to Watford."